Ever wonder how decisions are made about which products are included in a project specification? Want to know how you can help make project specifications better? Want guidance on what to include in meetings or presentations with architects and specifiers? This course, from the point of view of one independent architectural specifications consultant, is for product representatives who want to work better with specifiers, and better understand what makes some specifiers "tick." Our speaker is Liz O'Sullivan, CSI, CCS, CCCA. This webinar is FREE to CSI members and members of CSI's Product Representation Practice Group. Register now! Blueprints to BIM - How Can I Navigate this Environment? See a complete list of sessions, or register now at www.csinet.org/academies. What does it take to be a trusted advisor? Regardless of what product you represent, much of your success will be determined by: your skills, training, and understanding of construction; your ability to manage your network and resources; and your integrity and trustworthiness in the eyes of the community you work in. We'll address all three of these areas during CSI's Trusted Advisors Workshop. Topics will include: Ethics, Integrity, and Trust; Developing and Managing a Network; Identifying and Managing Your Representation Resources; and Know the Construction Process and the Players. Learn more. CSI has posted a recording of the webinar "Tips from Product Representation Experts" on the Institute's YouTube channel. Watch it or download the slides, or read notes from the session that were tweeted. What is the preferred way to approach Specification Writers/Architectures as a vendor in order to have them specify your product or add you as vendor? Advice for Product Representatives on Subcontractors? CSI members are let into the group once CSI has checked their membership status. Non-members are also allowed in the group case by case. Join the group! 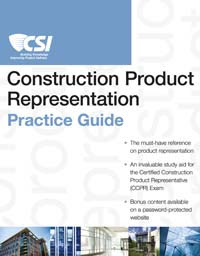 The must-have reference on construction product representation and the essential study aid for the Certified Construction Product Representation (CCPR) Exam, the CSI Construction Product Representation Practice Guide is an authoritative resource for the principles and best practices of effective construction product representation. This easy-to-follow guide covers a number of topics, including: the construction process and the roles a construction product representative can play in it; information that clients require to select appropriate products to meet project requirements; and the role a product representative plays in an Integrated Product Delivery (IPD) workflow. Member price $68/Non-member price $85. Learn more or order it. Building product manufacturers are using CSI's Corporate Partner Program to increase their exposure in the commercial construction industry. Each partnership is customized to the company's strategic business goals and objectives. Partner organizations enjoy value pricing on membership, education and certification, sponsorship and recognition opportunities, and increased visibility through CSI's network of construction professionals. See all 50+ partners and learn more at www.csinet.org/CorporatePartners. 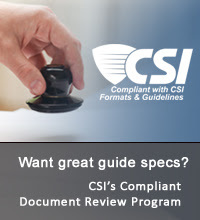 CSI's CDR Program for guide specifications is a structured program for reviewing manufacturer guide specifications for conformance with CSI formats and guidelines. Through the program, manufacturers can have CSI certified experts review their guide specifications for conformance with CSI formats and guidelines. Guide specifications that conform are posted at www.csinet.org/CDR and may use the CDR logo. Guide specifications are reviewed for their conformance with MasterFormat, SectionFormat and PageFormat. Other good specification practices as identified in CSI's Practice Guides are also considered. Learn more. CSI requires professionals who are renewing a Certified Construction Product Representative (CCPR) certification to have participated in continuing education related to product representation. Specifically, "50% of the topics must be related to the professional practice of the certification being renewed, as defined by the CSI Practice Guide." That's 12 hours of training! The aforementioned Product Representation Experts Webinar, Product Representative Academy, and Trusted Advisor Seminar will provide Professional Development Hours (PDHs) appropriate for renewing CCPR certifications. Select events at the Master Specifiers Retreat may also qualify. Learn more about renewal requirements at www.csinet.org/CCPR, and watch for CSI events that provide PDHs related to your certification. Older PostConstruction Chart Book, 5th Ed.